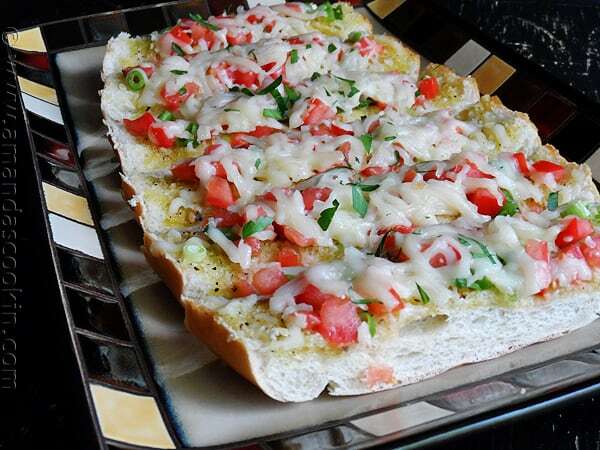 Bruschetta (pronounced [bru’sket:ta]) is typically a crusty bread brushed with olive oil, sometimes rubbed with garlic, and topped with a variety of fresh ingredients. There are many different versions of bruschetta, depending on your taste preferences, but I’m partial to fresh, ripe tomatoes mixed with a balsamic vinegar. However, I’m always willing to try something new, so this one was a no brainer. 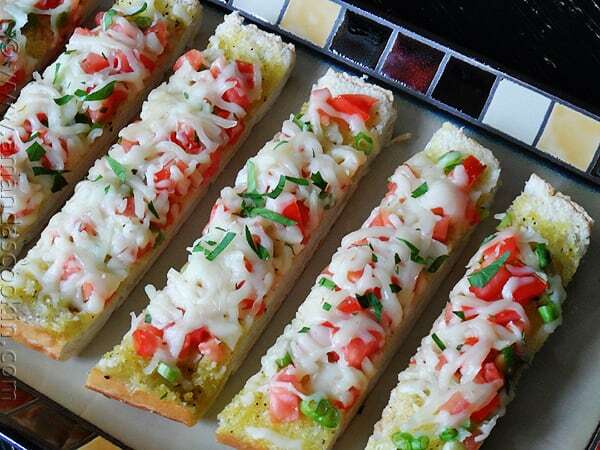 This bruschetta mozzarella recipe comes from the Sargento Cheese test kitchens. You can use Sargento mozzarella cheese or the Artisan Blend like I did. If you are looking for an easy recipe with a highly impressive appearance, make this. It tastes wonderful, doesn’t require anything complicated, and looks gorgeous on a plate. Yum! The original recipe calls for salt, though it’s listed as optional. I did use it but wouldn’t again. I found it to be a bit too salty, so next time I will just leave it out. I believe it really has to do with the type of olive oil you are using as they vary in strength and flavor. So feel free to add salt in with the olive oil if you like. Slice a loaf of Italian bread in half lengthwise. 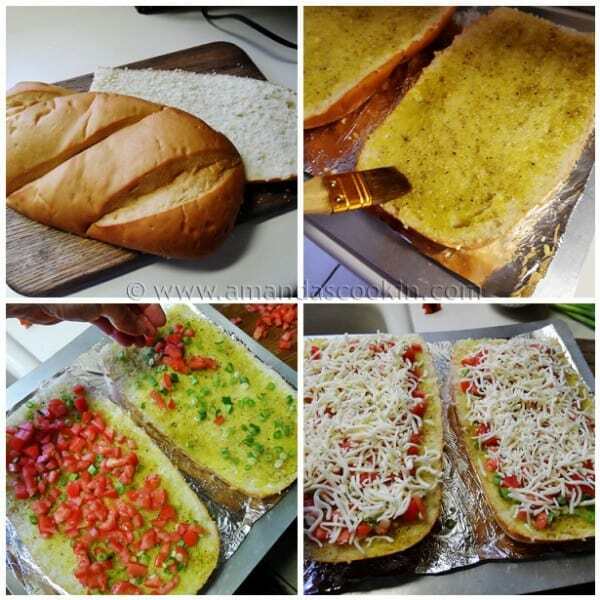 Brush it with olive oil mixture, sprinkle with green onions and tomato, then top with cheese. Bake it for 5 minutes or so at 500 F. Excellent. Easy. Couldn’t be better. Cut bread in half lengthwise. Place cut-side up on foil-lined baking sheet. Combine oil, garlic, and pepper; brush over bread. 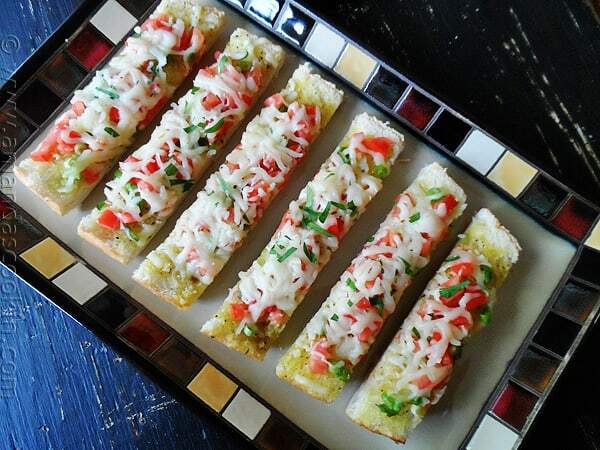 Sprinkle with green onions, tomato and cheese. Bake in preheated 500°F oven 5 minutes or until cheese is melted and edges of bread are browned. Cut into 1-inch pieces. Garnish with parsley, if desired. 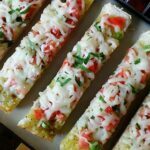 Provolone, bruschetta and mozzarella are wonderful! Breakfast recipes could not get much easier, better and yummier than this one! Lovely. I love bruschetta, this really does look pretty on the serving plate… worthy of taking to a gathering of friends to share! wow…simply wow!! those sound absolutely delicious and look gorgeous! i love the confetti of color! thanks for sharing! glad i found your blog! I’m always interested in easy-to-prepare dishes, and this does make an impressive presentation! I particularly like your thin, elongated pieces…they look so appetizing! I find that if I use cheese in a dish, I need little to no salt. I wanted to let you know that you are one of my nominees (I had to select five) for the Food Stories Award For Excellence in Storytelling! For more information, check out http://foodstoriesblog.com/food-stories-award/.